Scabiosa cretica, copyright Ori Fragman Sapir. As recognised plant families go, the Dipsacaceae is not a particularly large one. It includes only a few hundred species, of which the majority are found in arid regions around the Mediterranean and the remainder elsewhere in Africa and Eurasia. The economic significance of the family is also relatively low. Some species are cultivated as ornamental plants. Dipsacus fullonum, teasel, gets its vernacular name because its bottle-brush-like flower-heads were used to tease the fibres of woollen cloth. Various species of Dipsacaceae, particularly the genus Scabiosa, are known as 'scabious' because they were apparently once used somehow in treating scabies. I also came across a reference in Duke (2008) to Syrian scabious Cephalaria syriaca having had a certain notoriety in the past due to its seeds being similar in appearance to wheat grain, meaning that they could be inadvertently sown into fields, or impart an unpleasant taste if ground into flour. Flowers and fruits of Sixalix atropurpurea, copyright Manuel M. Ramos. Members of this genus grow on sand; their fruits have a reduced membranous wing, and disperse by rolling. Nevertheless, the Dipsacaceae are not without their points of interest. 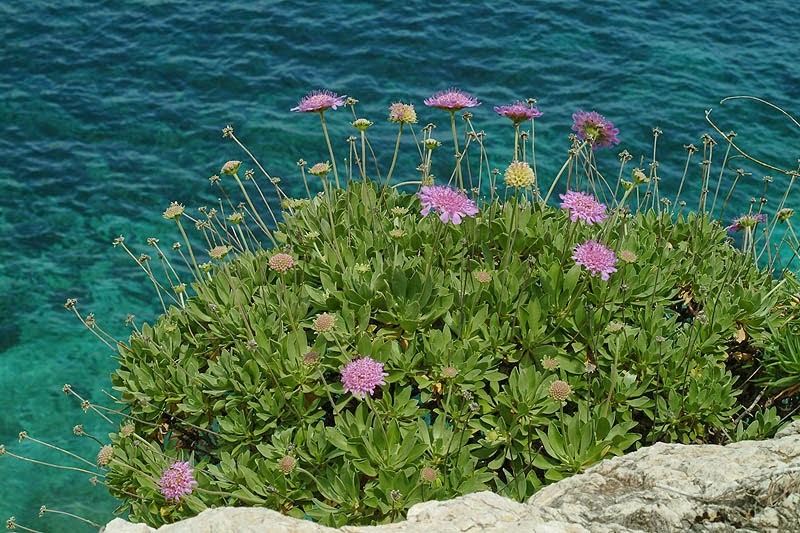 One intriguing characteristic of the family is that they bear numerous small flowers clustered onto a single shared receptacle, similar to those of the much more diverse Asteraceae. Like Asteraceae, there may even be a differentiation in the appearance of flowers on the inner part of the receptacle from those around the outer rim. The Dipsacaceae are not directly related to the Asteraceae; rather, the two families have developed their capitate flower-heads independently. Which is not to say that they are incomparable: species of both Asteraceae and Dipsacaceae exhibit duplications of genes that are believed to affect the development of floral symmetry (Carlson et al. 2011), and it is possible that similar processes have lead to the evolution of compound flower-heads in both. 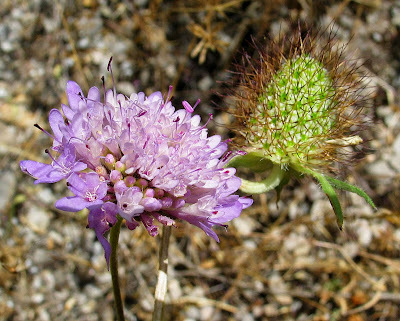 Flowers and fruits of Scabiosa sicula, copyright Jose Rodriguez. The fruiting head in focus shows the membranous wings that function in dispersal. Past authors have divided the Dipsacaceae into three tribes, largely on the basis of characters related to seed dispersal. Each of the small flowers on a dipsacacean flower-head develops into a dry fruit containing a single seed. The epicalyx (an outer protective layer of the flower base) persists as an outer coating of the mature fruit, like a second skin. In the largest of the three previously recognised tribes, the Scabioseae, the epicalyx is often modified for wind dispersal, either by plumose hairs on top of a dorsal tube (the same sort of set-up as seen in dandelions) or by a membranous wing around the fruit. 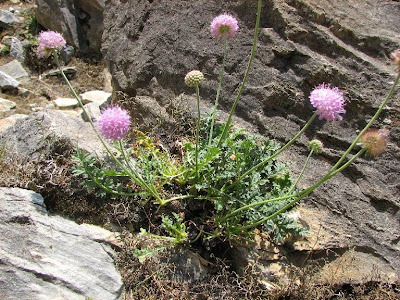 In contrast, the fruit of the genus Knautia, widow flowers, which has been placed in its own separate tribe, bears an elaiosome, a fleshy, hemispherical lump. The elaiosome attracts ants, who carry the fruit away to their nest; after the ants have eaten the elaiosome, the remaining seed is able to germinate where they leave it. Finally, the third tribe Dipsacaceae includes only the genera Dipsacus and Cephalaria; the mature fruit of these genera lack adaptations for either wind or ant dispersal, and seed dispersal is largely controlled by the break-up of the flower-head itself. Bassecoia bretschneideri, copyright Dave Boufford. More recent molecular analyses, however, have not entirely supported this three-way division of the Dipsacaceae (Carlson et al. 2009). 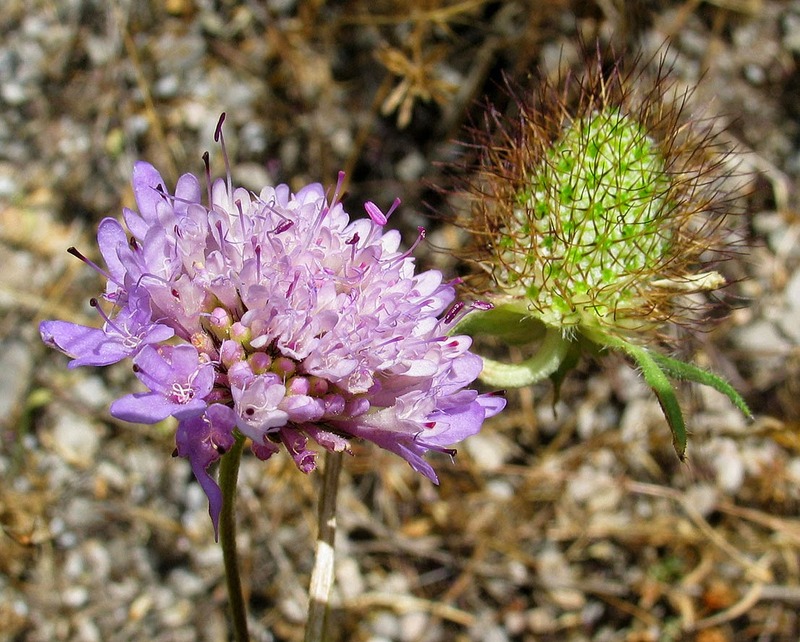 While Knautia and the Dipsaceae are both likely to be monophyletic, the Scabioseae are not. Instead, a small clade including the eastern Asian genus Bassecoia is sister to the remaining members of the family. 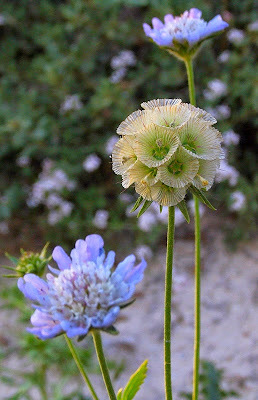 These fall into two major clades: one, that has been referred to as the Scabioseae 'sensu stricto', includes the majority of the taxa previously included in the Scabioseae, such as Scabiosa, Lomelosia and Pterocephalus. The other clade, which has been dubbed the 'dipknautids', includes Knautia and the Dipsaceae, together with a few smaller 'ex-Scabioseae' genera. While the original Dipsacaceae may have been wind-dispersed, they have not been above looking at alternatives. Carlson, S. E., D. G. Howarth & M. J. Donoghue. 2011. Diversification of CYCLOIDEA-like genes in Dipsacaceae (Dipsacales): implications for the evolution of capitulum inflorescences. BMC Evolutionary Biology 11: 325. doi:10.1186/1471-2148-11-325. Carlson, S. E., V. Mayer & M. J. Donoghue. 2009. Phylogenetic relationships, taxonomy, and morphological evolution in Dipsacaceae (Dipsacales) inferred by DNA sequence data. Taxon 58 (4): 1075-1091. Duke, J. A. 2008. Duke's Handbook of the Medicinal Herbs of the Bible. CRC Press.